If you liked this check out the album this track is from, Sugaring Season. Trailer Park is also worth a listen if you don’t already have it. Trailer Park was sent over to me by C when I was living in Malaysia. I loved it instantly and could not get over how beautiful it was in every way. You’ll feel calmer after listening to either record, guaranteed. What a lovely day, we’ve down visiting friends in Dunbar, it’s been sunny and very relaxing. The best bit is I’ve got a party for a good friend’s significant birthday tonight too, canny wait. There has been more plastering upstairs today, bits in the back bedroom, bathroom and stair wall. No photos today, I’ll give you the day off from them. Off to ‘get ready’ for the party, which means getting changed and children organised as quickly as possible. Doors and bathrooms have been high on the agenda today. Getting the bathroom bits and bobs sorted just takes ages. Glad to report I’ve ordered tiles, loos and a sink today. Good. The doors upstairs need to be chosen. Ideally I would get exactly the same as the downstairs doors made to match but that would be pricey and every penny counts at this stage of the regeneration. There is a search on for the best match to the downstairs doors, off the shelf as it were, we’ll see how it goes. The other door issues involve choosing where the new door in the front bedroom will be and whether the old bathroom door will do size regulation wise – the good news is it will be fine, phew. 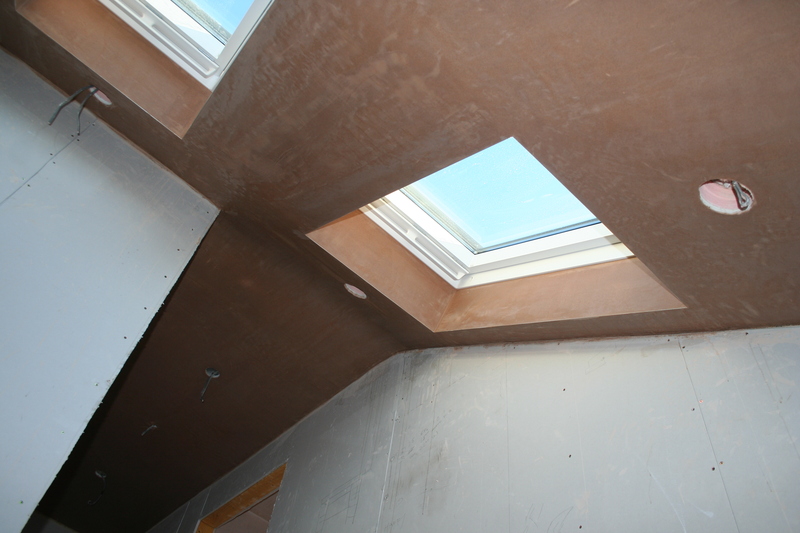 The plasterers have been doing their stuff above the stair, they had an elaborate plank, ladder and baton scenario to reach all the way up there beside my lovely skylights. There is another smooth and delightful curve at the top of the stairs, it looks superb. That’s all folks, off to play with my new gadget. It does begin with an ‘i’.